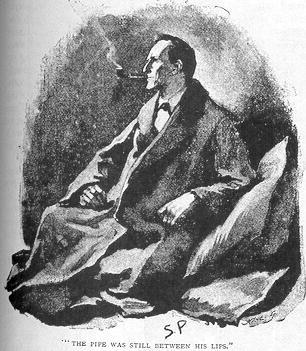 Sherlock Holmes as drawn by Sydney Paget. Movies play a large role in my life. I think about them, I pay money (too much generally speaking) to watch them in overcrowded, uncomfortable theaters and, since you’re reading this, you know I occasionally write about them and whatever impression they might have left me. Recently I watched Sherlock Holmes, the 2009 Robert Downey Jr. film, for the first time. Before I go any further, full disclosure. 1) I’m a Sherlock Holmes-nut and once belonged to a scion of the Baker Street Irregulars in high school (perhaps the nerdiest thing I’ve ever done and that’s saying something); and 2) I’m a big fan of Robert Downey Jr. going back to Weird Science. His work in Chaplain was great and even his more recent Iron Man projects were very well done. If you haven’t seen Tropic Thunder it’s well worth watching, Downey’s performance is brilliant. Was it the prefect Sherlockian film, no. Did the new, action-packed plot improve upon the author’s original stories, no. Let’s face it, that’s not going to happen. Those people who fell in love with the world and characters of the Sherlock Holmes stories did so for many reason. Modern adaptation only provide a gateway to discovering the original, nothing more. Go back to William Gillette on the stage in the early 1900s, Basil Rathbone in the 30s and 40s (fighting the Nazis, of course), Peter Cushing in the 60s and then – my favorite – Jeremy Brett in the 80s and 90s. While they were all great actors they ultimate fell short in their portrayal of Arthur Conan Doyle’s original for many reasons (bad scripts, direction, commercial/marketing reasons, etc…). With that in mind Downey’s portrayal was a unique take on the Holmes character (and I don’t mean that in a bad way). At times it was campy and occasionally overblown. The same can be said for Jude Law’s performance as Dr. Watson. Look no farther than the scenes having to do with their romantic entanglements – Dr. Watson with his fiance, and Holmes with Irene Adler. By the way, of all the elements in the film it was the return of Irene Adler and the suggestion of any romantic relationship with Holmes that bothered me the most. Read the opening to “A Scandal in Bohemia” and you’ll see my point. Adler represents a more threatening nemesis than Moriarty in that Moriarty, the “Napoleon of crime,” only represents a physical threat to Holmes whereas Adler was able to outsmart him and strike directly at his intellect. Having her pop in and out of his life, leading Holmes from one plot point to the next was bad story telling given the character’s history. At this point you might be under the impression I disliked the movie but I didn’t. Guy Richie, was an inspired choice of director. He’s got a great vision of London in the film, it’s dirty, bustling and with his eye for color, composition and detail makes the place come alive. His real triumph was the cinematography. One obvious example is the way he would stop or slowed-down the action to explain what was happening. By using the technique in Holmes’ fight scenes he intensified the brutality while demonstrating his thought process, illustrating one of the key aspects of the character. I look forward to the sequel that was released a couple of weeks ago despite mixed reviews. More than anything else I’m interested to see what has happened to one of my favorite literary characters at the hands of the modern film industry, villains worse than any Doyle ever conceived.